Below you will find a few examples of green roofs and roof gardens in the United Kingdom. Circa 90 different species of wildflower and grasses grows on the roof of Kanes Salad Factory in Evesham. The species selection was done in cooperation with ecologists familiar with the local area. This green roof sits on top of a standing seam roof. The roof also contains solar panels. In 2013, the roof received the National Federation of Roofing Contractors Sustainable Roof Award for Green Roofing. The Rolls-Royce Motor Cars factory at Goodwood features a 32,000 m2 sedum roof that helps the building blend in with the rural environment. This is one of the largest green roofs in Europe. Designed to be discreet, the plant is very difficult to spot from the road. In addition to having a green roof, the building is covered in limestone and cedar cladding and surrounded by 400,000 plants, including 120 different species of trees. After being derelict for two decades, the Fort Dunlop building in Birmingham was redeveloped into an office and retail space with an adjoining hotel in the mid-2000s. As a part of the redevelopment, the roof was covered in soil and grass to provide insulation and give local wildlife a place to be. 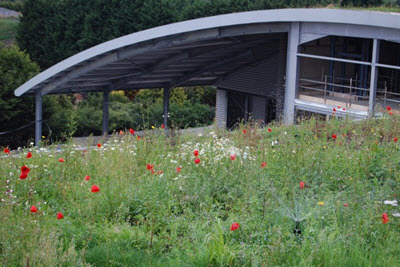 University of Nottingham’s Jubilee Campus (located where the Raleigh Bicycle Factory used to be, roughly a mile east of the main campus) contains many environmentally-friendly elements, including sedum-planted roofs that add insulation, help with storm drainage, and promote wildlife. The Center for Understanding the Environment (CUE) building at the Horniman Museum was built using sustainable materials and features a grass roof. It was inspired by the methods developed by Berlin-born architect Walter Segal. Green roofs were installed on the Ethelred Estate in Kennington, close to the Rive Thames in central London, as a part of a regeneration program aimed to enhance the community environment. Rolls soil with sedum plants growing in it where brought to the roof to make the installation process quicker and easier. The installations were completed in 2005. The planted roofs helps with internal thermal management, which in turn decreases the risk of winter fuel poverty for the occupants of the flats. Seeds produced by the plants on the roof help attract small garden birds, and doesn’t contribute to the existing pigeon problem since the pigeons prefer eating discarded human food. The headquarters of Barclays Bank, located in Canary Wharf, has a “stony meadow” living roof 160 meters above ground, overlooking the River Thames. This building is on the top-10 list of Britian’s tallest office blocks. Part of this living roof was planted, while many other parts were left to allow nature to colonize it on its own. Much of it was covered in broken brick and concrete, resembling a “brownfield” waste site or bombed building. Today, this 500 square meters roof is noted for its wide range of rare invertebrates. In the summer of 2005, the first Money spider (Linyphiidae) was spotted – to the delight of the bankers, of course. The roof was designed by Dusty Gedge, who expressed hopes that it would attract the rare Black redstart (Phoenicurus ochruros), a bird whose natural habitat is stony grounds in mountains, especially cliffs, but who has lived in urban parts of Great Britain for at least a hundred years since the modern urban environment provides it with a similar habitat. The species did for instance move into bombed areas during and after World War II, and it is also known to be fond of cliff-like buildings. Gedge created the “stony meadow” on top of the Barclays building by overlaying the existing concrete roof with rocks and pebbles, and then adding sand, soil and crushed concrete fetched from nearby waste sites. 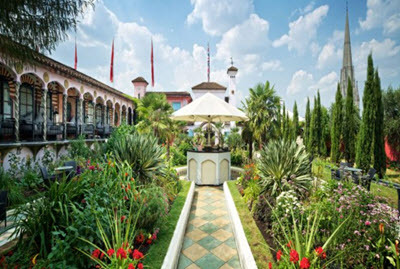 The Kensington Roof Gardens, formally known simply as The Roof Gardens, were created on the former Derry & Toms department store in 1938. Back then, they were called Derry and Toms Roof Gardens. 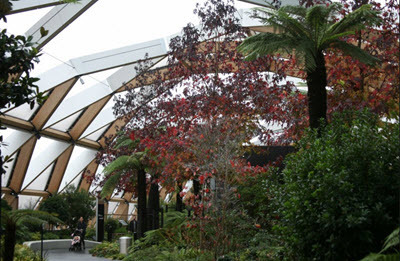 Covering 6000 square meters in total, The Roof Gardens are divided into three separate gardens, each with its own theme. One is an English woodland garden filled with many different species of trees. Some of the trees have grown here for over 60 years, and have survived well despite only have a meter or so of soil for their roots. There is also a stream and a little pond, which provides a home for pintail ducks and some (slightly incongruous) flamingos. One is a Tudor-style garden with roses, lilies, lavender and hanging wisteria. It smells marvelous during the warm season. One is a Spanish garden in a Moorish style, inspired by the Alhambra in Spain. It features vine-covered walkways, Chusan palms and several fountains.